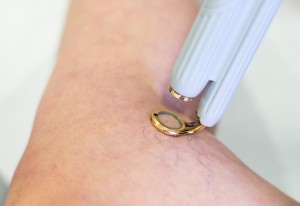 This week on the blog we’re talking about removing and reducing the appearance of thread veins. Thread veins are simply broken down blood vessels or capillaries, which can appear as red, blue or purple threads beneath the surface of the skin. They are very common and can appear anywhere on the body most often on the legs, arms, back of the hands and around the upper cheek area. 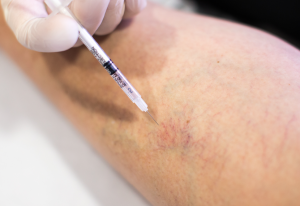 At Snowberry Lane Clinic we offer two treatment options to help deal with the issue of thread veins. In some cases we use medical lasers to help break down thread veins to reduce their appearance. The Laser works by penetrating the skin with light energy to work on the veins without affecting the surface of the skin. During treatment the laser energy will be focussed on the target area and will cause the unwanted capillaries to collapse and break down, over time they will dissolve away, reducing the appearance and in some cases removing it completely. Microscleratherapy utilises a medical solution that is injected into the target area to cause the veins to deteriorate, restricting blood flow to the vein and causing it to fade and in some cases disappear. This treatment is designed to encourage the body to naturally repair and that’s why some patients can have light bruises near the treated area. Within a few days this dies down and after a few weeks patients are left with uniform colouring around the skin. If you’d like to learn more you can request a call back from Snowberry Lane by clicking here. This entry was posted in Leg Veins by Emily. Bookmark the permalink.